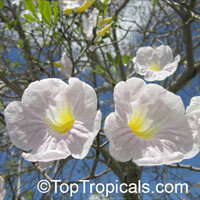 Roble Blanco, Blushing Bride, Narrow Trumpet Tree, White Wood. 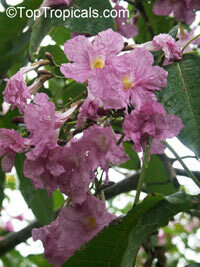 This tabebuia found in woodlands and along streams in Jamaica and is very rare in cultivation. 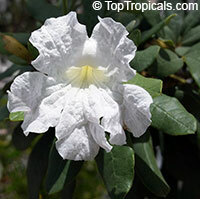 It has has very pretty, rosy white blooms coming in clusters. 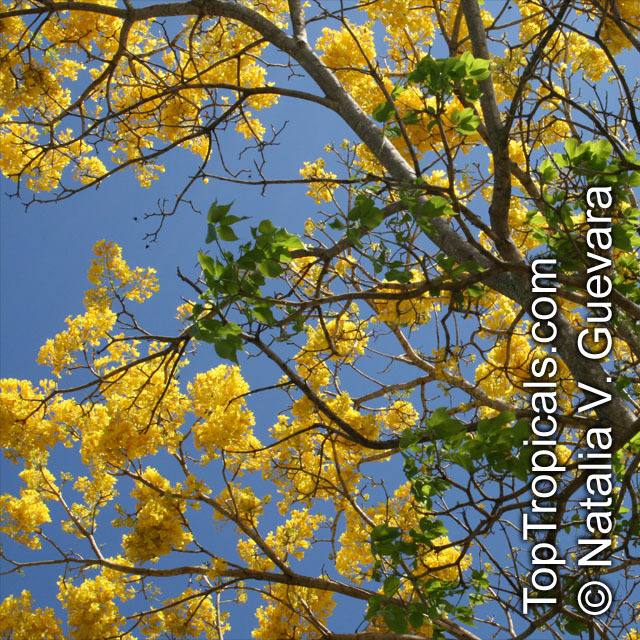 The tree can grow up to 40 feet high, tolerates some drought and poor soils. years after germination. It would make an ideal tree for patios. 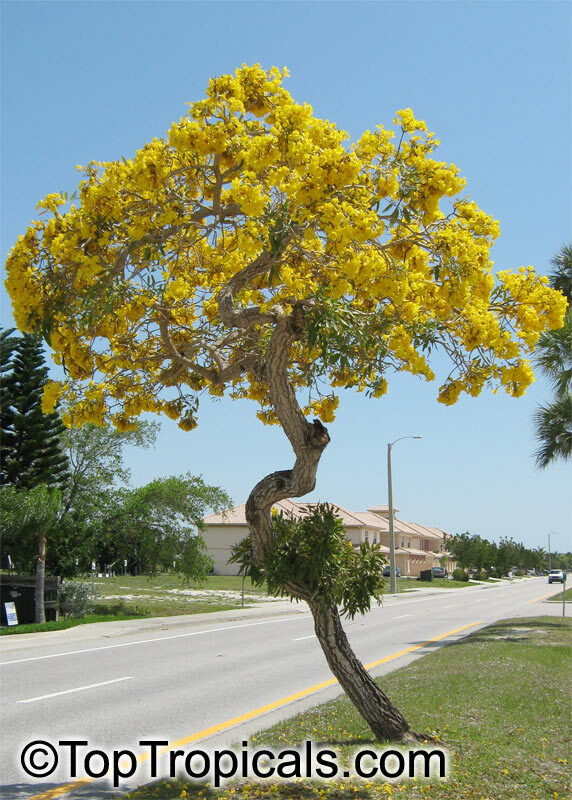 Silver trumpet tree, blooms in winter with bright yellow flowers that cover the tree completely, before new leaves appear. Hardy and easy to grow. Dwarf Golden Tabebuia. 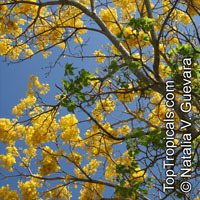 A sparse crowned small to medium tree with large heads of golden yellow flowers which may open over a period of a few weeks. 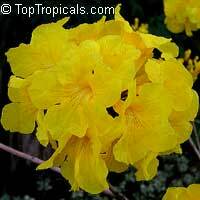 This tabebuia is a good choice for a small garden or potting culture. 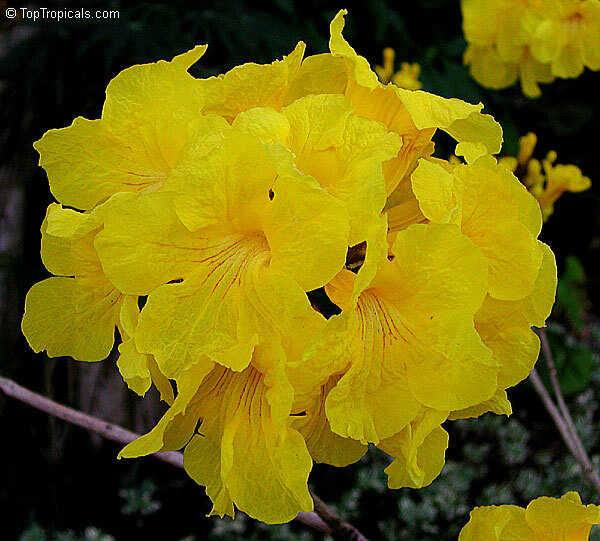 Dwarf Golden Tabebuia. 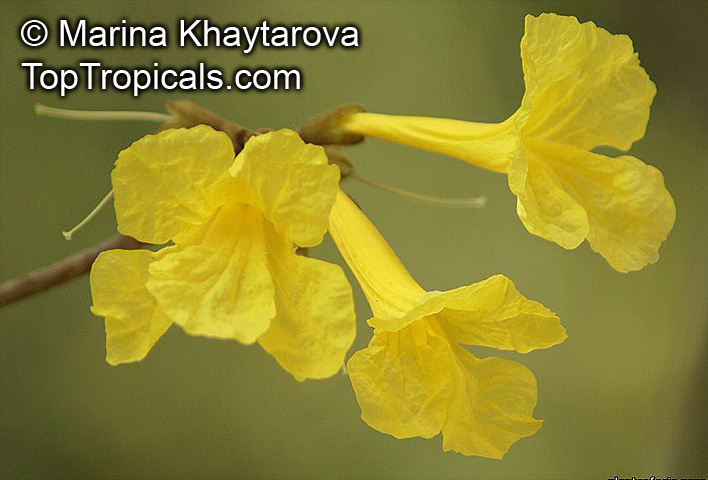 A sparse crowned small to medium tree with large heads of golden yellow flowers. Good choice for a small garden or potting culture. 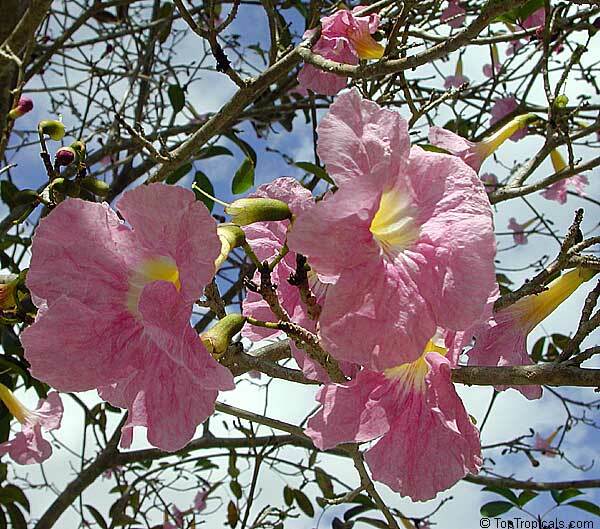 5456 Tabebuia haemantha x impetiginosa Pooh-Joe - Dark Pink, grafted ? 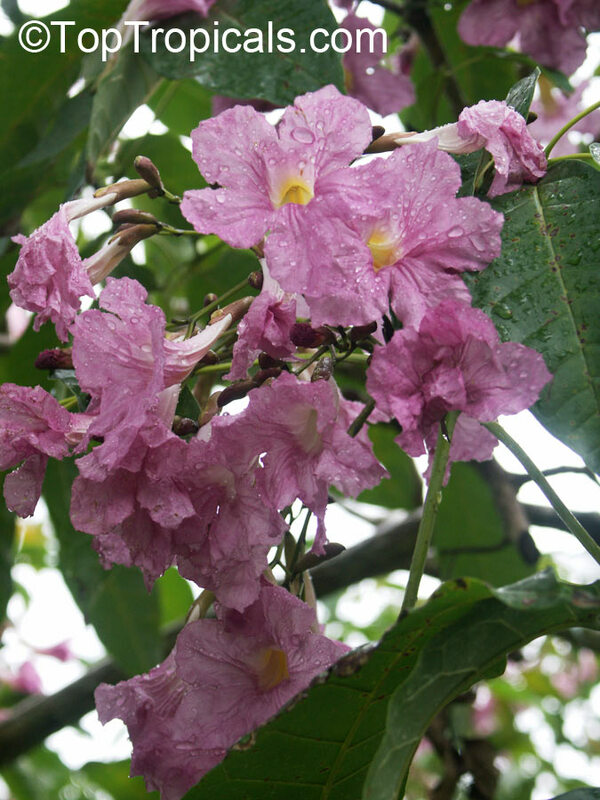 This is a unique, rare variety of T. impetiginosa that have very deep, dark pink color of flowers with bright yellow throats. When in full bloom, it is an amazing show! 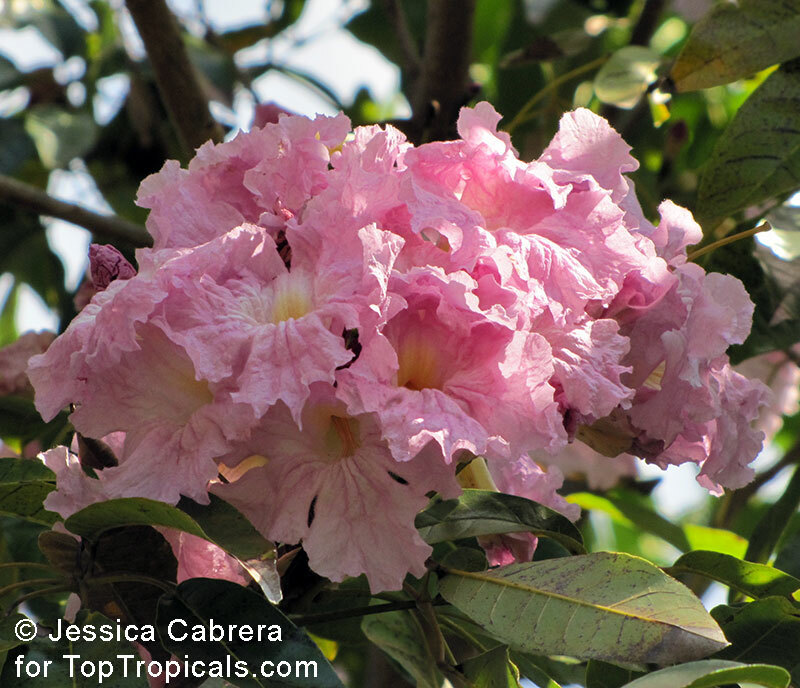 Regular T. impetiginosa has light pink flowers and is more common. 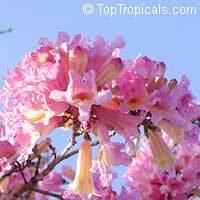 Silver trumpet tree with bright pink flowers covering the tree before new leaves appear. Blooms winter through spring. Silver trumpet tree. Spectacular pink blooms cover the whole tree in winter-spring. 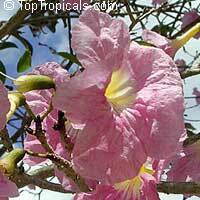 Dwarf Pink Tabebuia. 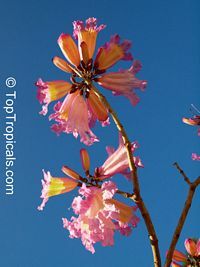 Nice small landscape with beautiful bright pink flowers with yellow throat, covering the tree before new leaves appear. Winter bloomer. Very cold hardy plant, cold hardy at least to 26F. Tabebuia rosea is a wide upright evergreen or deciduous tree with a a long smooth trunk. Leaves are oblongs to ovate-elliptic, leathery, scaly and mid- to dark green in color. Funnel-shaped, white, pink or lilac flowers with yellow eyes fading to white are produced. 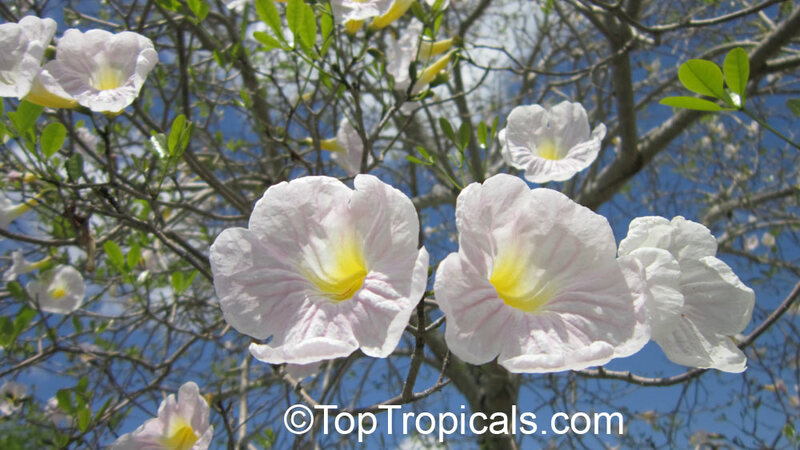 White Trumpet tree. Rare variety with white flowers. 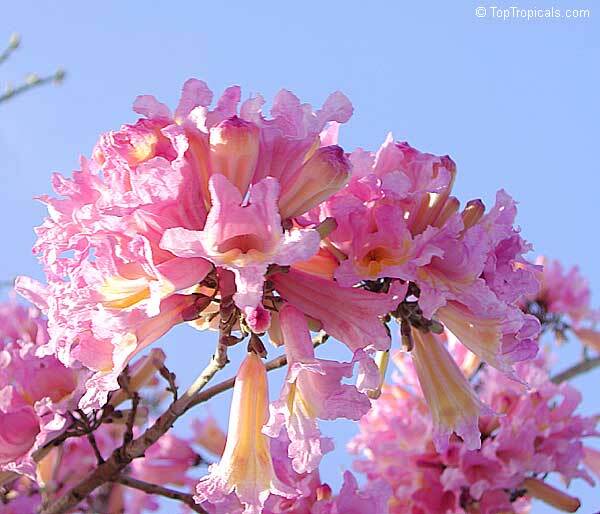 In regions with a sharp division between wet and dry seasons the Trumpet Tree annually sheds its foliage and the leafless branches are covered with clusters of white to pale pink flowers.